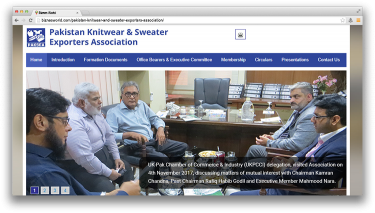 Description Pakistan Knitwear and Sweater Exporters Association is the leading trade body representing the knitwear, sweater and fabric exporters of Pakistan. The Association was established in 1987 with the objective to promote and develop export of knitwear, sweater and fabrics. Address 1014 – 16, Park Avenue, P.E.C.H.S, Block-6, Shahrah-e-Faisal, Karachi.